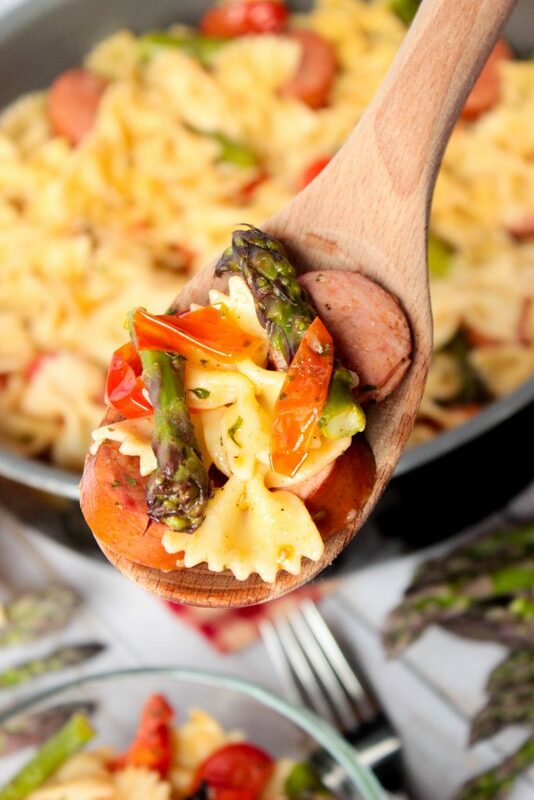 This Asparagus Kielbasa Bow Tie Pasta is a fresh and easy Summer lunch or dinner recipe that everyone will love! It’s no secret that we love asparagus around here. 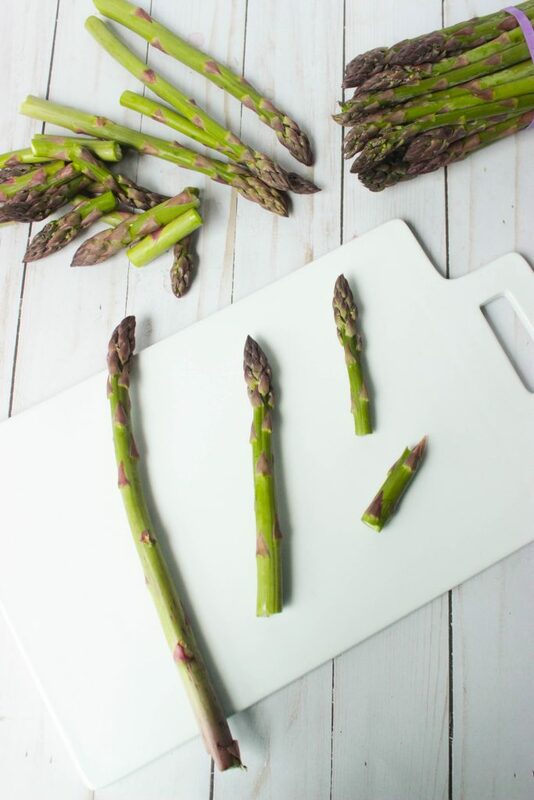 Asparagus is one of those vegetables that we pick up from the grocery store or the Farmer’s Market every week and use it in recipes about twice a week. We use it in sheet pan meals, we steam it with a bit of butter and garlic powder, and we even grill it during the summer. Last week, Michigan Asparagus sent me a huge box of freshly harvested Michigan Asparagus. 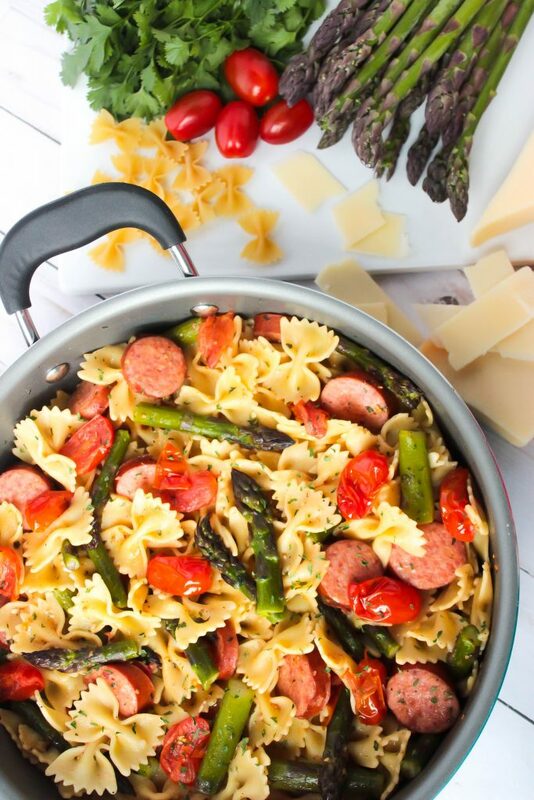 With a box full of fresh Michigan Asparagus, I got to work in the kitchen creating another great way to use asparagus, and that’s in my light Asparagus Kielbasa Bow Tie Pasta! I love working with Michigan Asparagus each year to create amazing recipes for y’all and to showcase their beautiful asparagus! Asparagus season is somewhat short, and sometimes (like this year) it gets even smaller due to frost and cold temperatures, so we like to use it as much as we can while it’s fresh from the fields! Not only is it great in fresh recipes like this one that I’m sharing with y’all today but we also love asparagus because it has no fat, no cholesterol, and very little sodium. It’s also considered a “Clean 15” food. That means that asparagus has a low pesticide load and is one of the safest conventionally grown crops to eat! 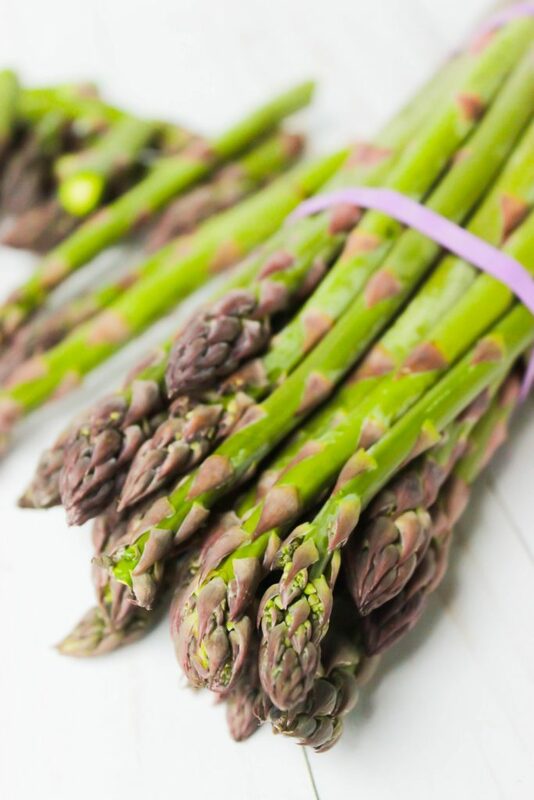 Did you know that Oceana County, Michigan is nicknamed the “asparagus capital of the world”?! They are also home to the National Asparagus Festival held every June! So let’s chat about this Asparagus for a second. 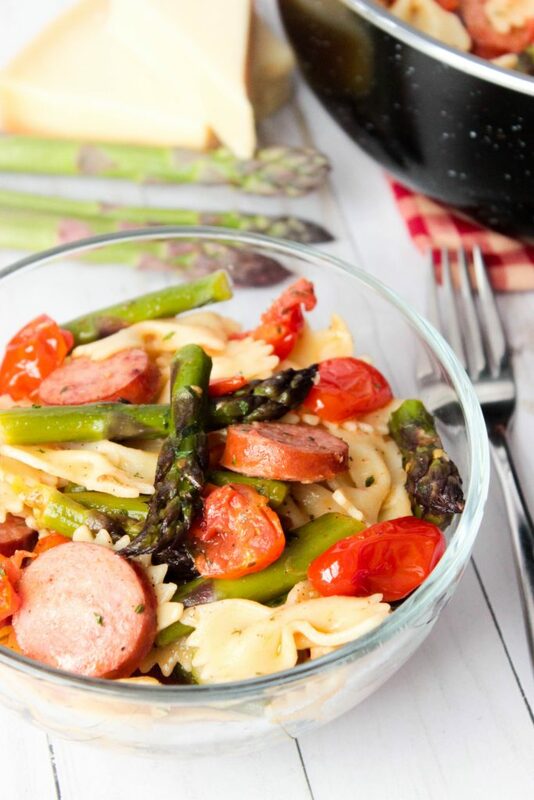 These are the stalks of asparagus that we’re using for this Asparagus Kielbasa Bow Tie Pasta recipe. You’ll notice on your stalks of asparagus that the end is somewhat rough and tough. You’re going to want to remove that before cooking. Just bend the stalk of asparagus towards the end and snap off the end. 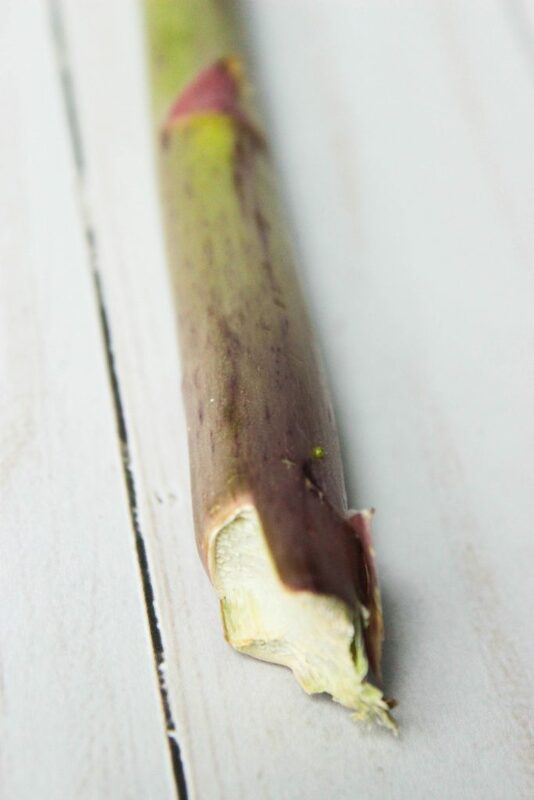 Use that as a guide to chop the rest of the stalks of asparagus or just snap the ends off of each stem like I do. Toss those ends into the trash or compost pile. For this recipe, I like to snap my asparagus into 2 or 3 parts, depending on how tall the asparagus stalk is. .
As you can see in the photo above, the asparagus stalk on the left is the one straight from the store/market, the middle is a stalk that I’ve snapped the end off of and the right asparagus is where I’ve snapped it into 2 parts to use for the recipe. I’ve got the full recipe below for y’all, but here’s a quick over view of how this light and easy summer pasta recipe comes together. We’re starting off with some olive oil and garlic. Then we’re adding the sliced kielbasa to the pan just to brown it a bit and heat it up. 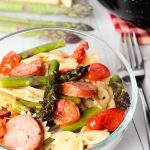 Kielbasa should already been fully cooked when you buy it, so don’t worry about the short “cooking time” for it in this recipe. Then toss in some cherry tomatoes that have been sliced in half. You just want to cook these for a minute or two until they’ve started to burst a bit. Then the cooked pasta goes in with a simple toss to combine everything together and your meal is done! 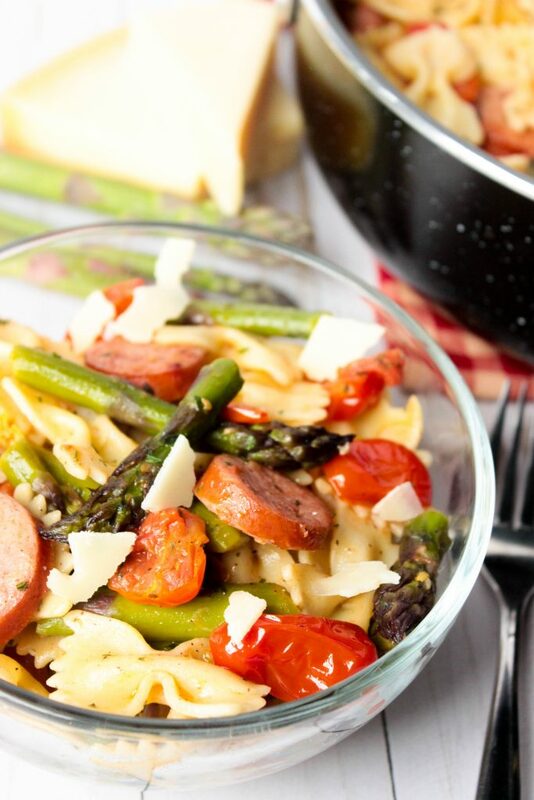 This Asparagus Kielbasa Bow Tie Pasta is 100% perfect alone for a lunch or dinner! I normally have about 1 cup of this for lunch and then if we’re having it for dinner or if I’m super, super hungry, I’ll have 1 cup of this pasta and a small salad along side of it. Double the amount for lunch or dinner and you’ve got the serving size that my husband loves. You can leave that part out if you’re not a fan, but we really do love the addition of the cheese. 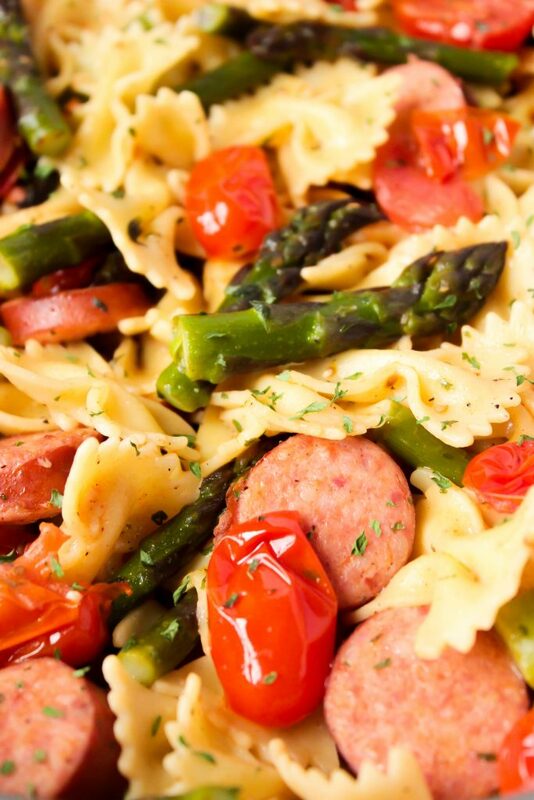 Save time and dishes by cooking the pasta and asparagus in the same water (but not together). Remove the pasta with a slotted spoon when it’s done cooking and then add the asparagus to the boiling pasta water for about 5 or so minutes. Salt the water after it's boiling to make it "like the ocean". I normally just add a few tablespoons, as I don\'t want it overly salty. Add the pasta. Set a timer for 12 minutes. Heat a large skillet over medium/high heat. Once hot, add olive oil and garlic. Cook garlic for about 30-45 seconds and then add in sliced kielbasa. Cook for 8-10 minutes or until hot and slightly crisped on a few sides. 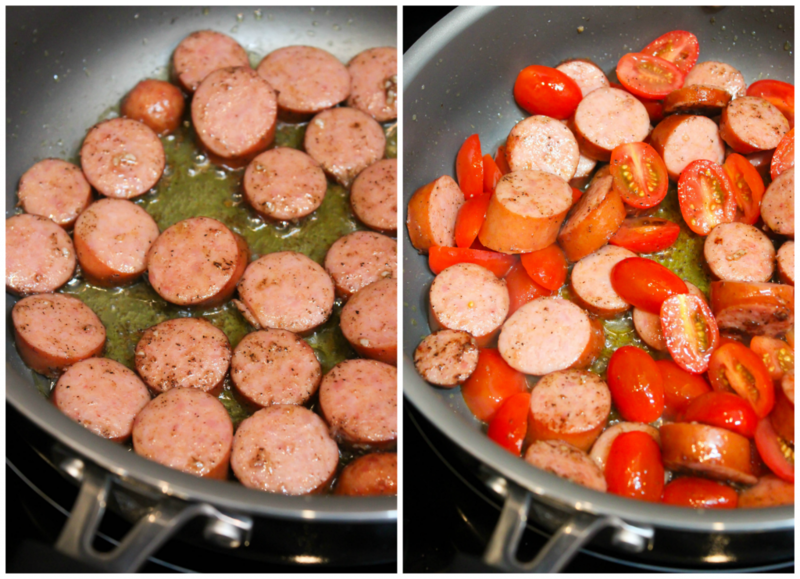 Add in cherry tomato halves and cook for 3-4 minutes. 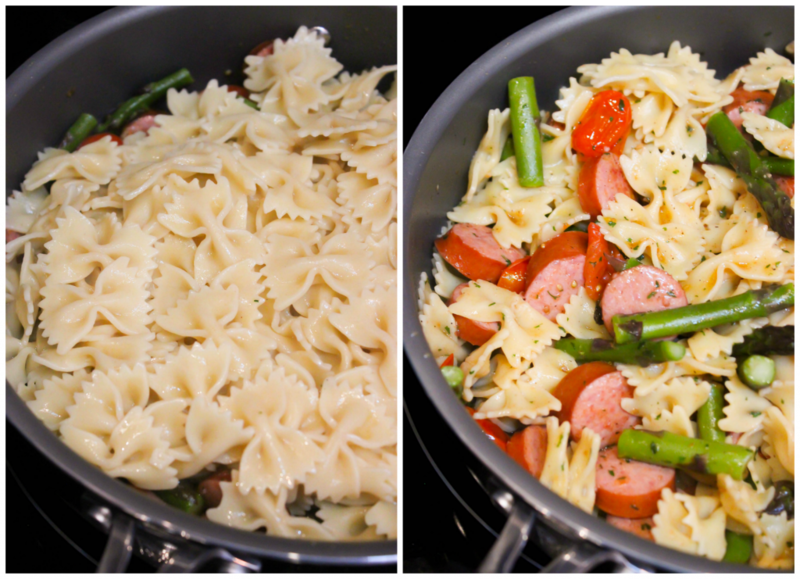 Once pasta is done, remove it with a slotted spoon and set aside. DO NOT drain the pasta and pour that water down the drain. We\'re using that to cook our asparagus! Add the pieces of asparagus and boil for 5 minutes. 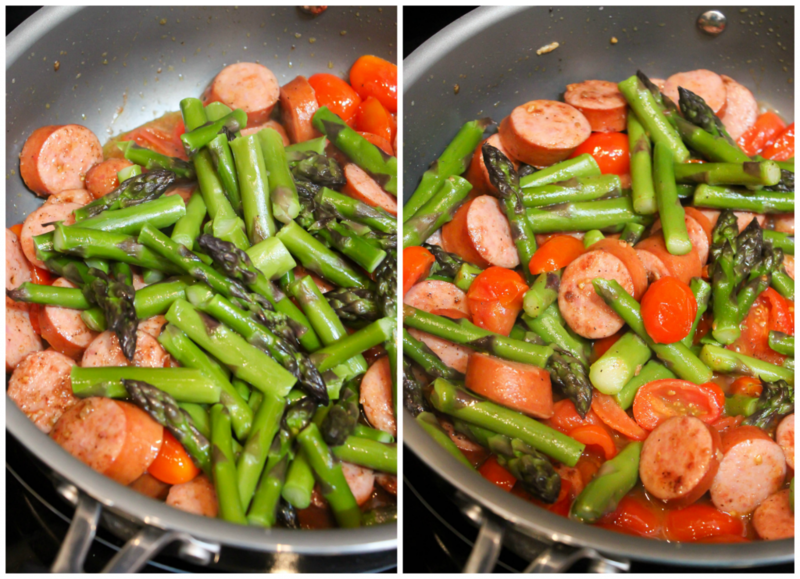 Remove asparagus with a slotted spoon and add to the kielbasa and tomatoes. Add in cooked pasta and stir until everything is well mixed together. Add a touch more olive oil is anything looks dry and stir well. Heat for just a few minutes to make sure everything is hot and serve. Optional - garnish with a few big slices of Parmesan cheese. Mmmmm this looks sooo good, a perfect HOT weather meal. Another winner my dear. Also want to thank you for the e-book. I make something like this but use red pepper slices and I drizzle some soy sauce over it. ooo sounds good. I don’t cook with red peppers because my husband is allergic but I love the soy sauce idea! We can’t get enough Asparagus in this house, it’s a favorite of the whole family, and it’s so versatile.